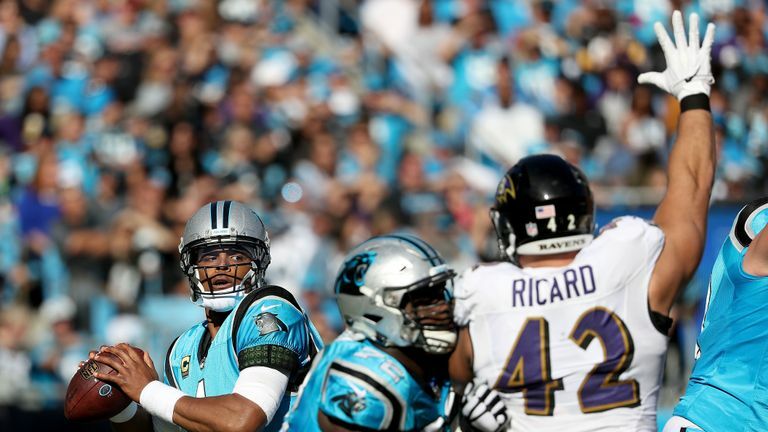 A comeback victory over the defending Super Bowl champion Philadelphia Eagles in Week Seven has spurred the Panthers (6-2) on and, in the two game weeks since, they have earned a hard-fought win over the Baltimore Ravens and their No 1 defense, before brushing aside the Tampa Bay Buccaneers. Meanwhile, the Steelers (5-2-1) are showing they are more than coping without Le'Veon Bell, who has returned to the city but is still yet to report to the club - which he must do by 13 November - with James Conner stepping out of his fellow running back's shadow. 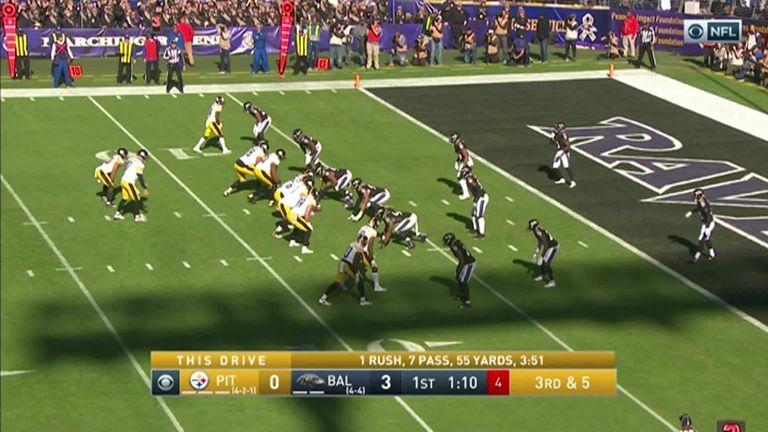 The Steelers boast a four-game win streak themselves after turning around their season following a dismal 26-14 loss to divisional rivals Baltimore in Week Three, which had left them 1-2 and bottom of AFC North. That run has seen Mike Tomlin's side sweep aside the Atlanta Falcons before romping to divisional wins over Cincinnati Bengals, Cleveland Browns and claiming revenge against the Ravens in a 23-16 victory last week. Conner is on pace for 2,170 scrimmage yards this season, following on from Bell's 1,946 last year. The only other time a team has had two different players record 1,900-plus scrimmage yards in consecutive seasons was the 1998 and '99 Indianapolis Colts. Hall of Famer Marshall Faulk recorded 2,227 scrimmage yards in 1998, then Edgerrin James had 2,139 in the 1999 season. Can the Panthers defense stop Conner? At the start of the season, most teams would have felt the biggest threat in the Steelers' offense was Bell. But, his continued absence has become less and less important as the weeks have passed, with the emergence of Conner. 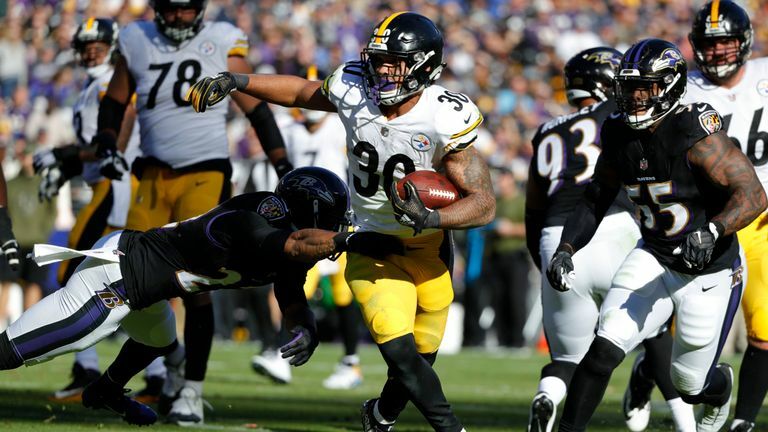 And, as unlikely as it may seem, Conner is on course to outstrip the records Bell has previously set, having already created history by becoming the first Steelers player to score two or more rushing touchdowns in three consecutive outings - in Weeks Six, Eight and Nine around their Week Seven bye week. The 23-year-old has picked up over 100 yards in his last four games and it is no coincidence that Ben Roethlisberger and co have a winning streak to match that. The Panthers must find a way to stop Conner. Steelers quarterback Roethlisberger has stepped up his game in the second quarter of the season and currently has a 93.9 QB rating for the season. Last week he combined with Antonio Brown for their 68th touchdown - the seventh most in NFL history - and the pair are chasing down New Orleans Saints duo Drew Brees and Marcus Colston (72) in sixth. Christian McCaffrey is pursuing his own record as he aims to become just the seventh player in NFL history to have at least 1,000 rushing and receiving yards in their first 25 games in the NFL. The Panthers second-year running back needs just 63 rushing yards on Thursday to achieve that feat. Watch the Carolina Panthers play the Pittsburgh Steelers on Thursday Night Football, live on Sky Sports Action and Main Event from 12.30am on Friday morning. Follow the 2018-19 NFL season with us on Sky Sports and through our website skysports.com/NFL also our app for mobile devices and iPad, or follow our Twitter account @SkySportsNFL.